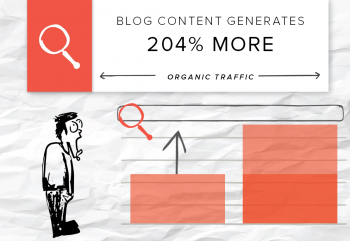 Content marketing is an important part of SEO strategies, especially as best practices evolve. Our client increased its organic traffic 204 percent quarter-over-quarter with a content strategy that prioritized giving readers valuable information through approachable blog articles. Link buying and keyword-stuffing haven’t always been taboo, but they are now that Google is policing the web with its Panda and Penguin algorithms. You take risks when you invest in the hot SEO tactics du jour. The tips and tricks that circulate today might cause penalties down the road. Great content, however, will never go out of style, or lose efficacy. High-quality written posts, original visuals and videos will always be useful to your audience if they contain valuable information (and aren’t out of date). Search engines recognize that content is a great measure of a website’s relevance for certain key terms and is ranking pages accordingly. A payment processing company partnered with Brafton for a content strategy that supported its entire sales funnel. It wanted blog content for SEO and traffic building, downloadable eBooks for lead generation and custom-designed infographics for engagement. Use long-tail keywords naturally, because they fit right in with the story. The weekly blog posts we created for the company gave us an opportunity to use long-tail keywords naturally – because they fit right in with the story. Long-tail keywords are often low-hanging fruit because there’s less competition for visibility, and you can see results sooner by targeting them. Here are more tips to finding your money keywords with tools you probably use already. In a good content marketing strategy, keywords aren’t the focus. You shouldn’t be creating content just so you can saturate articles with keywords. It will come out thin and people won’t enjoy reading it. And if people don’t like reading your content, Google probably won’t reward it with prime search real estate. Keywords should be a seamless part of the narrative, blending in as context to the story you’re telling. The old-school SEO in you might be nervous about this approach. If they keywords are just in the background, will they help your search presence at all? The answer is yes. Last year’s Search Metrics report showed a strong correlation between content with relevant terms and higher rankings (even more so than use keywords in headlines, subheads, etc). Google’s Hummingbird algorithm was designed to understand context, because the search engine wants to make sure you’re not just plugging keywords into content to rank well. You can learn more about this search algorithm in this free eBook on semantic search. By writing articles about payment processing trends, consumers’ preferences around payment technology and tips for businesses, Brafton’s content writers used long-tail keyword phrases organically at a frequency that put the client’s website on Google’s radar. The blog posts were increasing the website’s visibility in search, which was the client’s top goal for its written content strategy. These results were putting the business head and shoulders above the competition. Our client was outranking others in its field across high-visibility keywords, and it was also getting play on search terms that competitors don’t rank for at all. Which meant it was dominating searches in the space. To capitalize on these initial improvements, we recommended that the company update its product landing pages to optimize for the terms in its keyword strategy. This would add to the results it’s already seeing with the blog content. 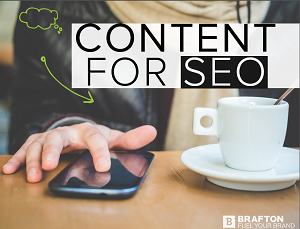 For a complete look at how to create content that ranks in the current SEO climate, check out Brafton’s eBook and updated infographic on Why content for SEO.